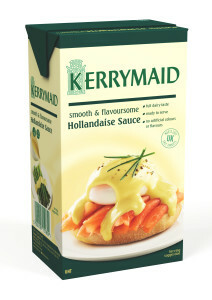 Smooth and delicious Hollandaise in a convenient ready-to-use format. Developed by chefs, for chefs – taste just like made from scratch. Can be used as a versatile base for creating other sauces. Gluten-free and consistent in quality and taste. Reduces waste, saves time and space. Endorsed by the Craft Guild of Chefs. Meets 2017 FSA Salt targets. Request your free sample to discover the taste.